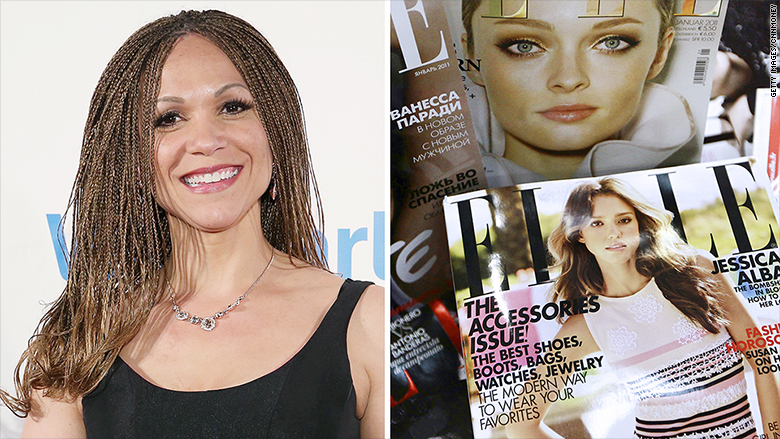 Two months after a public dispute and departure from MSNBC, Melissa Harris-Perry is joining Elle.com as an editor at large. "This gives me a chance to talk politics, but also culture, race, gender, and literally shoes," she said in a telephone interview. Harris-Perry won't work full-time with Elle, but will write and appear on-camera regularly. Her version of "Comedians in Cars Getting Coffee" is "Smart People Talking While Shoe Shopping." The actual title of the web video interview series is "Sole Search." "This is me shoe shopping with women and girls of color," she said, "sometimes for themselves, sometimes for charity, sometimes for others, sometimes with men." Her first guest on the series is Teresa Younger, the head of the Ms. Foundation for Women. Leah Chernikoff, the Elle.com site director, said Harris-Perry brings an expert voice to the site's coverage of race, gender and other topics. "She will, as her work has always done, highlight the stories of women and girls — a reader might get to see an interview with a prominent female politician, a Black Lives Matter activist, or a celebrity," Chernikoff said. "Or they might read Melissa's writings on topics ranging from feminism, intersectionality, and motherhood, to fashion and even gardening." Harris-Perry is an endowed professor at Wake Forest University. She became the host of a weekend morning show on MSNBC in early 2012. The talk show, while relatively low-rated, was beloved by its core audience for hosting in-depth conversations about subjects like race and gender. It was nicknamed "Nerdland." In January and February the show was placed in a form of cable news purgatory, first by focusing on primary election coverage and then by being pre-empted for two weekends in a row. Harris-Perry felt the show was being "taken" from her without due consideration or communication from MSNBC management. The fight was fundamentally about editorial control. MSNBC said her show was not being canceled and that the changes were temporary, but the public dispute resulted in her departure from the channel in late February. Since then, she has spoken with a number of media outlets about what she might want to do next. "My husband James and I have had a lot of conversations about what audience I want to be talking to and who I hope will be interested in listening," she said. Elle.com, she said, will help her reach a diverse audience. Harris-Perry said "I'm not looking to make a television show or a podcast or something like that right now, but there will be other spaces where I'll be doing some writing and some video content." She is also hosting a series of events called "Nerdland Forever" — live events that replicate some of the feel of her former talk show. The first one will take place on Tuesday in New York City.